The church of Ste. Pierre (St. Peter) in Moissac, France, dating from 1115-30, has one of the most impressive and elaborate Romanesque portals of the twelfth century. Carved images occupy the walls of the extended porch leading to the door, the door itself, and even the space over the door. The church of Ste. Pierre was on one of the pilgrimage roads through France that led to Santiago de Campostela, in Spain. As it was home to the remains of St. James Major, that Spanish church was one of the most important pilgrimage sites in Western Europe. Ste. 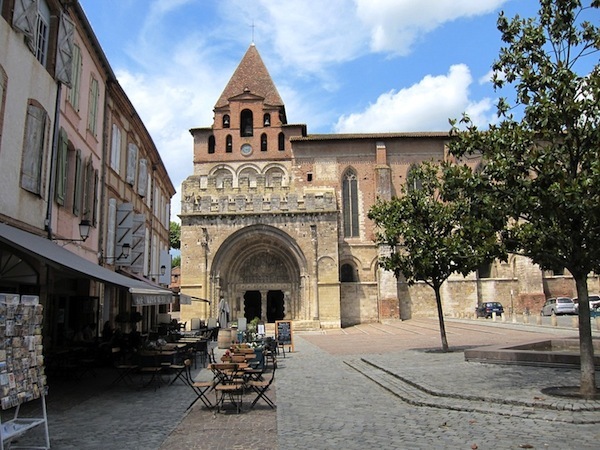 Pierre in Moissac was a popular stop for those making the long and arduous journey to Spain. 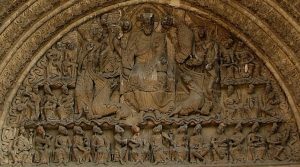 In order to understand what is depicted on the main areas surrounding the portal that leads into the church, let’s break it down into its constituent parts. 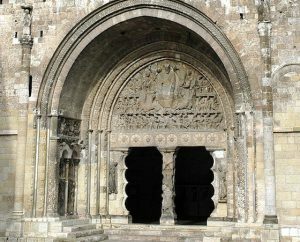 The term portal refers to a doorway or entry into a building, and Romanesque portals have distinct architectural elements which were oftentimes carved with a variety of ornament and subject matter. In the case of Ste. Pierre, the portal is divided in half vertically by the trumeau, which is decorated on three of its four sides. On the front, the viewer is faced with three pairs of intertwined lions and lionesses who are there to symbolically guard the entry into the sacred space of the church. Such symbolism comes from Early Christian imagery where the doors to Christ’s tomb are often shown with lion’s heads on them. 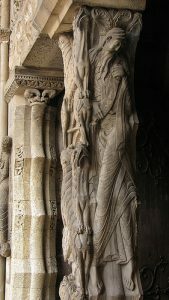 On the east side of the trumeau is a representation of the Old Testament prophet Jeremiah (some scholars suggest it is Isaiah), who holds a scroll in his hands. On the west side is a figure identified as St. Paul, from the New Testament. 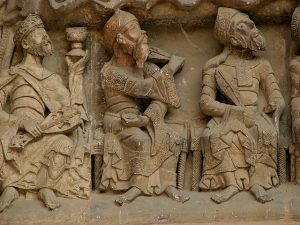 The placement of these two figures on the sides of the trumeau was no doubt deliberate as they face two other figures on the door jambs (the outer walls of the portal where the doors are attached). Across from St. Paul is a representation of St. Peter, also a New Testament saint (and the namesake of the church), and across from Jeremiah, is the Old Testament prophet Isaiah. The pairing of Old and New Testament figures was common during this period as a means of suggesting the fulfillment of Mosaic law (the law coming Moses) in the new Christian law under Christ. The trumeau has more than just a decorative function though as it is also supports the horizontal beam of stone above called the lintel. 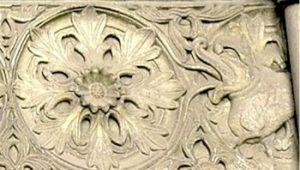 The lintel is decorated with ten rosettes that are bound together by a carved rope and have a repeated floral pattern at both the upper and lower spaces between each rosette. Notice that on both the left and right ends of the lintel, the rope and rosette design is coming from the mouth of a fantastical animal of some sort (image, above)! Details such as these, with imaginative, hybrid animals are a common characteristic in Romanesque art from illuminated manuscripts to sculpture. 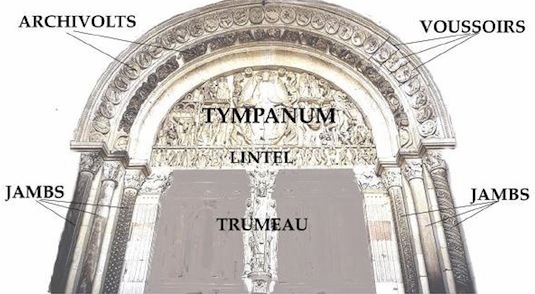 Just above the lintel is the lunette-shaped (semi-circular) tympanum, which has the majority of the sculpted decoration (and this is true in most Romanesque and Gothic portals). 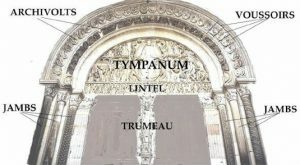 In this case, the tympanum is surrounded by three decorative archivolts (arches), which have various foliate patterns carved into the individual blocks of stone, known as the voussoirs, which make them up. 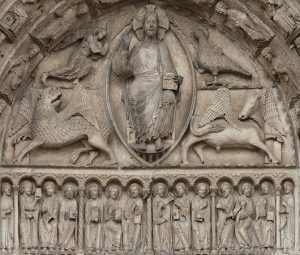 During the Romanesque and Gothic periods, there were two subjects which were popular for tympanum decoration. One was the subject of the Last Judgment, when Christ sits as judge over those who will be divided into the Saved and the Damned. An example of this can be seen at Autun. And immediately I was in the Spirit, and behold a throne was set in heaven, and one sat on the throne…And round the throne were four and twenty seats; and upon the seats I saw four and twenty elders sitting, clothed in white raiment; and they had on their heads crowns of gold…And before the throne there was a sea of glass like unto a crystal; and in the midst of the throne, and round about the throne, were four beasts…And the first beast was like a lion, and the second beast like a calf, and third beast had a face as a man, and the fourth beast was like a flying eagle. The moment described in this passage, and represented here, is not a narrative in the sense that the Last Judgment is, but it is rather a more esoteric concept of the Second Coming of Christ and the End of Time. In the very center of the composition is the figure of Christ, seated on a throne, with his right hand raised in gesture of blessing. In his left hand he balances a book on his knee, perhaps a reference to the Book of Revelation. His circular halo is inscribed with a cross (known as a cruciform halo), and we can just make out the suggestion of a larger, almond-shaped body halo (called a “mandorla” after the Italian word for almond) just visible as the pointed arch behind Christ’s haloed head. Immediately to the left and right of the seated figure of Christ are the Evangelical Beasts, three animals and one human figure, who represent the four Evangelists who wrote the New Testament Gospels. Matthew, in the upper left, is represented by the winged man, Mark just below is shown as the lion, Luke on the bottom right is seen as the ox, and John the Evangelist is represented as the eagle. 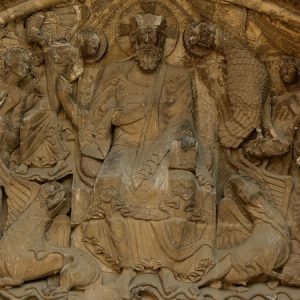 The representation of the four Evangelists as a tetramorph was common in sculpture, painting, and illuminated manuscripts. On either side of the Evangelical Beasts are two tall, elegant angels holding scrolls, as well as the twenty-four elders mentioned in the text from Revelations. They are arranged on three levels, two of which are divided by wavy lines, reminding us of the “sea of glass.” Each elder holds a small musical instrument in one hand and a chalice in the other (some of these have broken off over time). Very clearly all of the figures—man and beast—are turned toward the central figure of Christ, who stares serenely out toward the viewer. The twenty-four elders crane their necks and twist their bodies as do the Evangelical beasts. Even the lines of the drapery seem to be directing our attention toward the center. 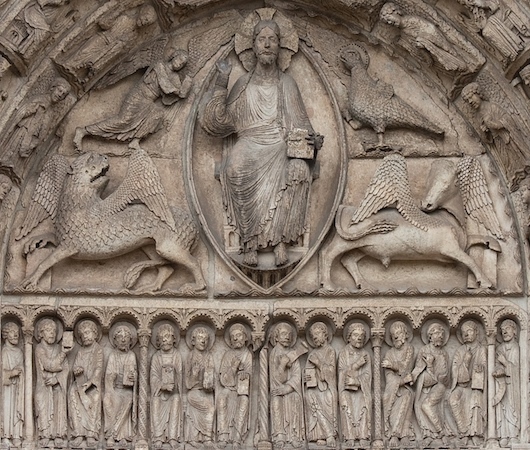 A brief comparison between the style of the sculptures in this tympanum and that employed on the Early Gothic portal of Chartres Cathedral (above), which is also a Maiestas Domini, clearly illustrates the very lively, almost agitated sense of the figures at Moissac. 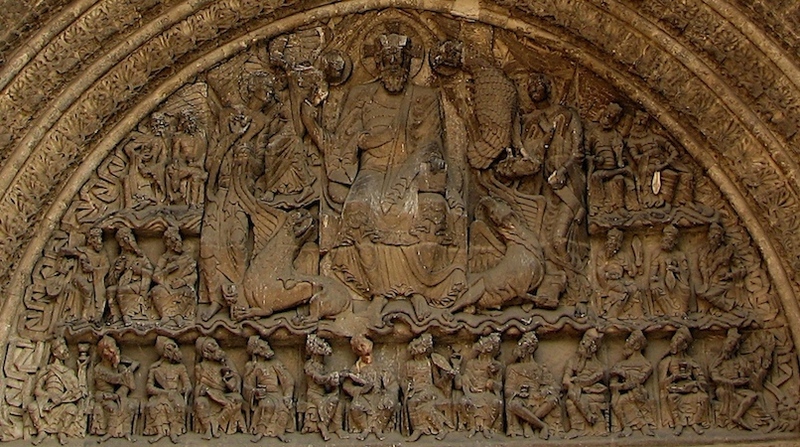 At Chartres, the twenty-four elders are now the voussoirs in the archivolts and the figure of Christ, seated frontally and surrounded by the mandorla, is flanked by the four evangelical beasts. Here, however, is a sense of clarity and three-dimensionality that is markedly different from the style seen at Moissac. And as the road weary pilgrims would have approached the portal of the church Saint-Pierre, they were met with spectacular imagery that warned against sin, and reminded them of Christ’s sacrifice and his final coming. 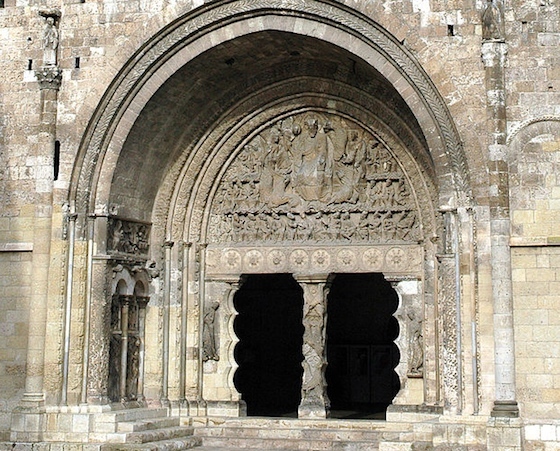 The portal at Moissac would have been a veritable feast for the Romanesque viewer’s eyes and souls. This entry was posted in Architecture, Art History, History, Medieval, Middle Ages. Bookmark the permalink.